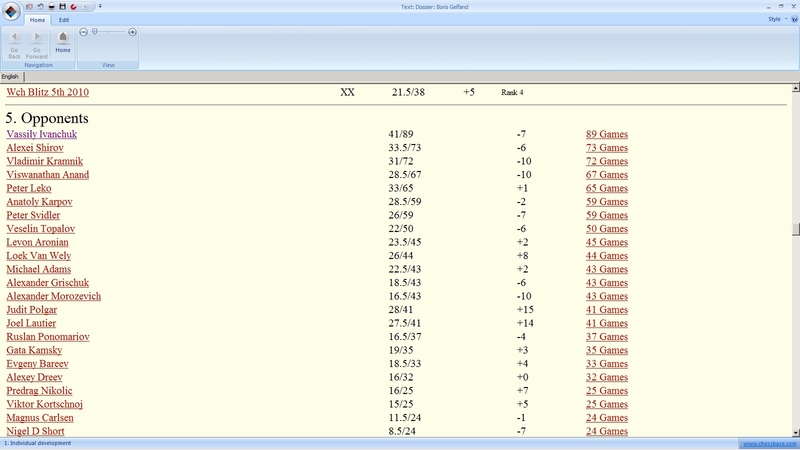 The ChessBase 11 chess database program provides its users with a cornucopia of useful tools for information gathering. Some of these tools actually qualify as a toolbox all on their own – they provide “one-click” access to a bundle of separate (but related) functions which are all carried out in a single operation. 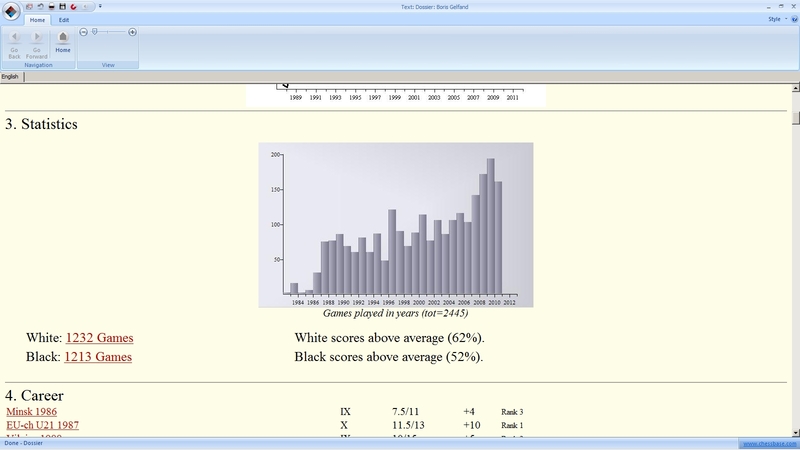 The Player Dossier is one such function: it creates separate windows for a player’s White and Black repertoires, as well as a text window which provides fast access to a great deal of information about the player in question. As you can see in the above pic, Boris Gelfand is going to be our victim – I mean, player – today. After highlighting his name in the Player Key, we’ll click the “Player Dossier” button. The “Repertoire” setting offers some fine-tuning of the much information you’ll receive about the player’s opening choices. “Coarse” provides primarily main lines (that is, the player’s preferred openings) and to no great depth. “Fine” puts the repertoire under a microscope and gives very detailed information on even the most offbeat variations the player has tackled, and the variations displayed will be longer as well. The tradeoff here is time for information – the “Fine” setting takes a bit longer to produce results than does the “Coarse” setting. The “Normal” setting is a good general-purpose setting for most of us who don’t need to examine a player’s repertoire down to the nth degree (the odds of my ever playing Boris Gelfand in a tournament setting are so low as to be considered essentially nil). “From year” provides control over whether the dossier for a currently-active player will encompass his entire career or just the last few years. You could set this, say, to “2009” to see just his/her recent repertoire, tournament results, etc. “First name length” is primarily a display function. The dossier will contain plenty of player names, so if you’d like narrower columns in the display you’ll want to set this value to a lower number. 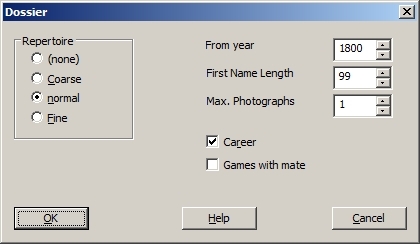 Checking “Career” will include various highlights from the player’s chess career (including “Spectacular games” as separate sections of the dossier, while checking “Games with mate” will also create a separate section on this topic. Note that unchecking these options doesn’t leave out games or information from the overall results, but checking them will create special additional sections as part of the dossier (as we’ll see). After you’ve set your desired options, click “OK” and let the magic begin. Generating a dossier might take a couple of minutes, so don’t jump the gun — give it a little time. You’ll see a series of progress bars appear in a series of dialogues at center screen. 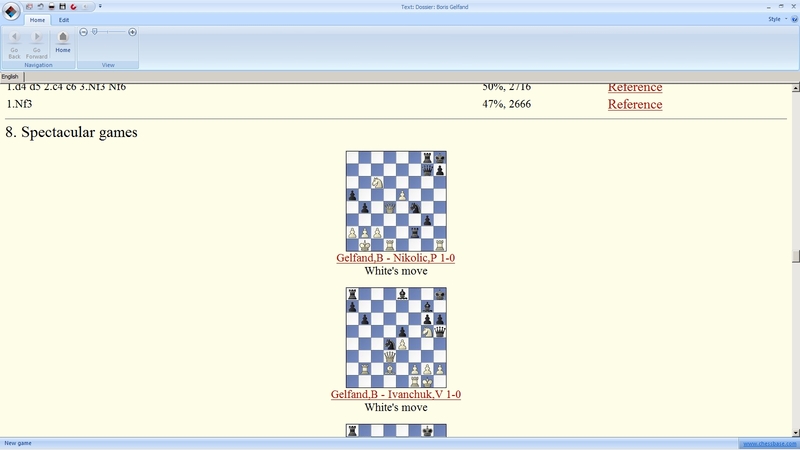 ChessBase 11 will open two separate windows, one with the player’s repertoire as White and one with his/her repertoire as Black. These windows are exactly what you’d receive as output if you’d clicked the “Prepare against White” or “Prepare against Black” buttons in the ribbon near the top of the screen. Do you recall back at the start of this post when I said that the Player Dossier is a “toolbox” which bundles together several separate ChessBase 11 features? 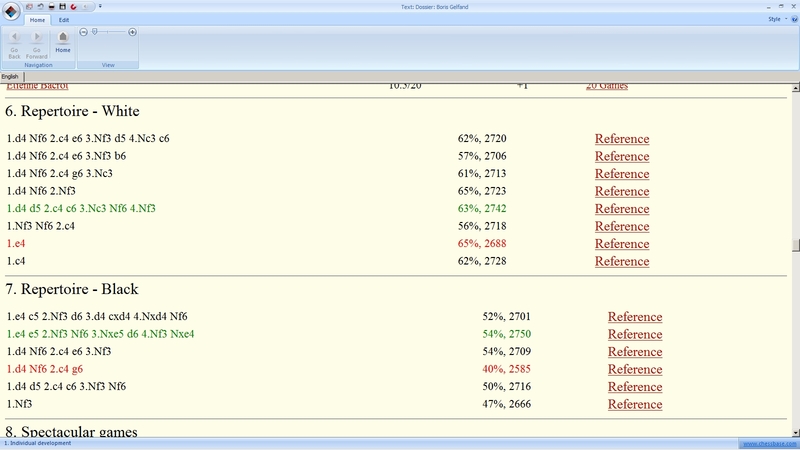 This is an example – here you get the same results that you’d receive using both of the “Prepare” buttons. This window is the actual dossier. 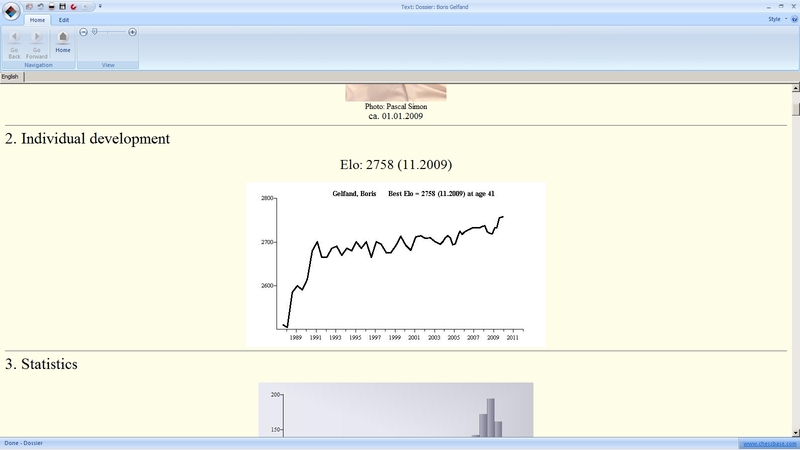 The top section is a “header” containing some general biographical information on the player. 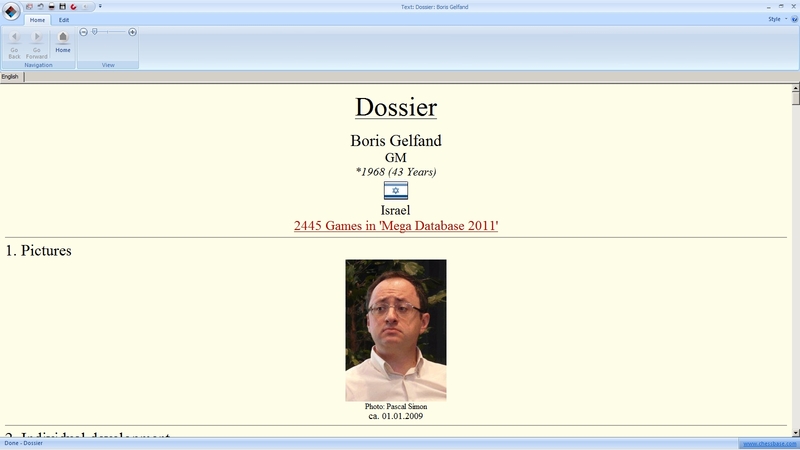 The header also contains a link to all of the player’s games; in this case, clicking on the “2445 Games in Mega Database 2011” link will open yet another window, this time a game list of all of Gelfand’s games. The next section contains photos of the player (the number of which we’d set in the initial “Player Dossier” dialogue). Provided in chronological order, we have links to the crosstables for specific tournaments, plus extra information like the FIDE tournament category for the event, Gelfand’s score, and his final position in the standings. 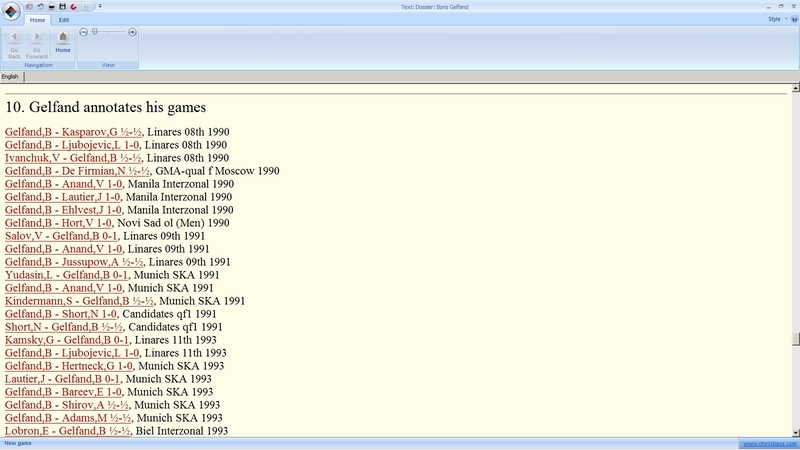 Clicking on a player’s name brings up a window with some “fast info” about that player (similar to the header and the first two sections of an actual Player Dossier), while clicking the link in the right-hand column brings up all the games which the two players contested against each other. 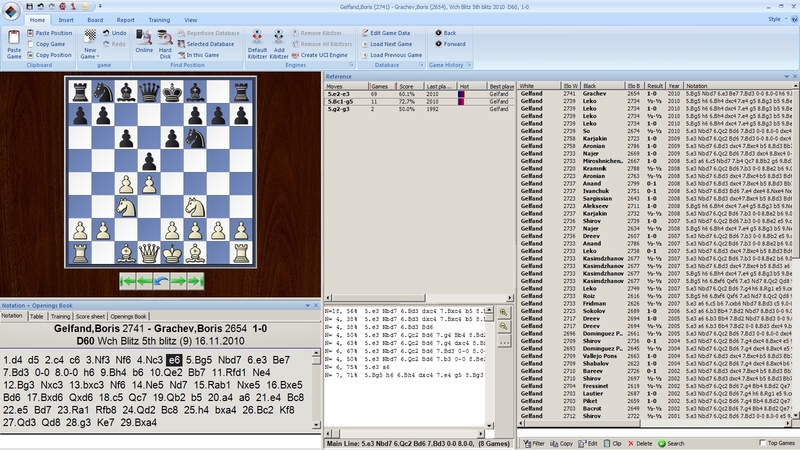 As before, clicking the highlighted link below the board will open the game in a separate window so that we can see how mate was delivered. 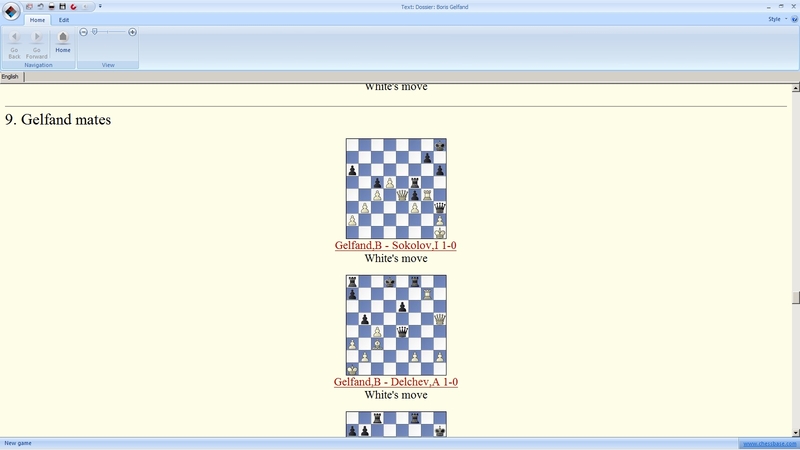 These are links to Gelfand’s games which Boris Gelfand has himself annotated. It goes without saying (although I’m about to say it anyway) that these games are a marvelous source of information, in which a top-level player is letting you know what he was thinking while the game was being played. To me, this is the single most important section of the Player Dossier for the improving chessplayer. 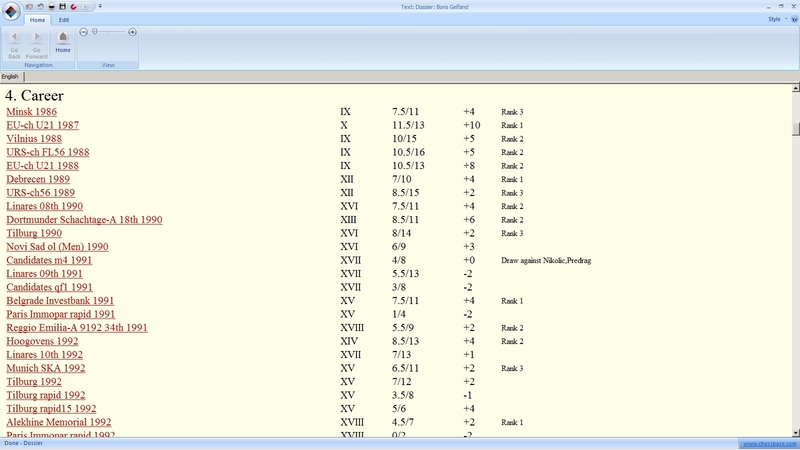 In fact, that’s why I’m writing this post – to show you this little hidden treasure of the ChessBase 11 software. 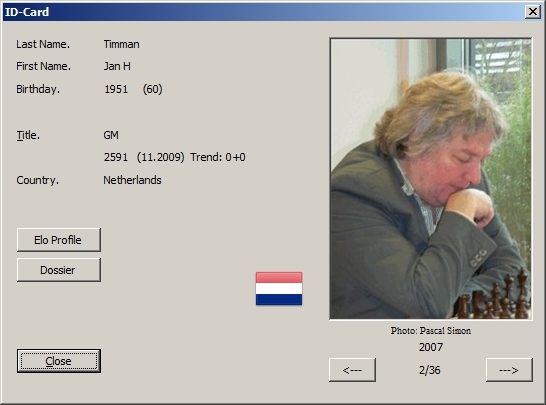 Although you can save a Player Dossier into the database, there’s really no reason to do so – a new (and updated, if the player is still active and you’ve been keeping your master database current) dossier can be generated using Chessbase 11 in just a few moments at any time.